St. Mary’s Food Bank Alliance, the world’s first food bank, was founded in Arizona in 1967. John van Hengel was volunteering at St. Vincent DePaul when a mother told him that soup kitchens and dumpsters were her only sources of food to feed her family. With a $3,000 grant from his church and an available building, the process of donors “depositing” surplus food and the hungry showing up to “withdraw” it was born. Today, Feeding America is a nationwide network of 200 food banks and 60,000 food pantries and meal programs. As of 2014, Feeding America reported that 1 in 7 people in the U.S. relied on food banks, including 25 percent of military families (620,000 households). Feeding America provides many more facts about hunger in America here. The app from 1F1R lets restaurants create a sponsored meal, which then is paid for by donations from businesses or individuals. At that point, a local food bank is contacted and they then allocate the meal to a family. The family goes to the restaurant for a meal that is already paid for. Writing for the Island Packet, one of the leading news outlets for the Lowcountry of South Carolina, Maggie Angst shares a new innovation in the fight to end hunger. The Fed40 app created by Feeding Children Everywhere is available for use on Apple iOS and Android devices through the App Store and Google Play. The app promises to connect residents to 40 nutritious meals (40 packets of Red Lentil Jambalaya) delivered in a box within a day to their front door. Recipients only need to submit a short form establishing their need. Taking after a host of app-based takeout delivery services such as Seamless, GrubHub, Eat24, and DoorDash, as well as meal-kit subscription services like Blue Apron and Plated, the Fed40 app seeks to provide food delivery to those in need, only free of charge. “I think that model (of feeding the hungry through food pantries) is going to go away completely in the next few years,” said Dave Green, CEO of Feeding Children Everywhere. “Companies like Amazon and Blue Apron that intersect technology and an efficient supply chain system are mastering this space. “But the humanitarian sector is no different. We have to replicate what the for-profit world is doing, because there shouldn’t be anyone in the U.S. who had to go a day without food. We have all the food, it’s just about getting it to those people in need efficiently,” he said. Only it’s not just about efficiency. It’s also about honoring the dignity of the recipients. The packaging and the delivery system are discreet, deflecting the shame and loss of self-respect that spring from powerlessness. 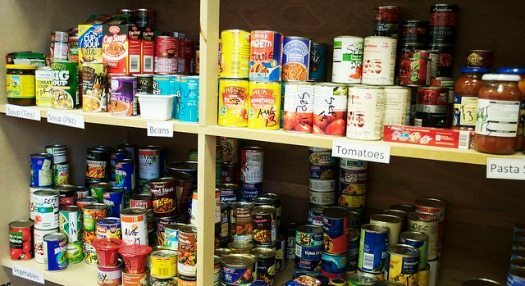 Especially for people and families newly experiencing hard times, and in particular veterans, the journey to the food bank is a price often too painful to pay for what they receive. Fed40 was launched last November in Florida, where Feeding Children Everywhere is based. After testing the Fed40 app there, Fed40 now works in Alabama, Connecticut, Louisiana, Mississippi, Oklahoma, Texas, North Carolina, and South Carolina. They expect the program to go national by the end of 2018.